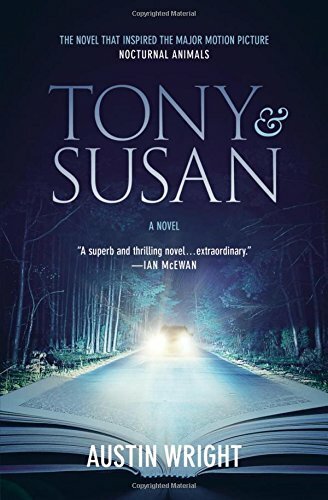 Originally published in 1993, and republished several times since then, Tony and Susan (also known as Nocturnal Animals) has most recently been released because of Tom Ford's recent movie Nocturnal Animals based on it. The device of the novel is novel: a middle aged woman Susan, reads a novel by her ex-husband, Edward. Both have remarried. It takes her three nights to read the manuscript, which he has sent to her asking for her feedback. As she reads, she reflects on their relationship and the man she left him for. Before she starts, confident of her memory of Edward, she predicts the book will not be a detective novel nor a story of blood and vengeance. But it turns out she is wrong. It is very much a story of vengeance. Edward's novel, Nocturnal Animals, is about a story of an nighttime encounter between a math professor, Tony Hastings, and three strangers on a dark road in Maine. The strangers commit a terrible crime, and the rest of Tony's life is devoted to getting even. The novel inside the novel is unpleasant and disturbing. One of its main themes is how weak and indecisive Tony is in the face of the strangers who bully him. Later on, as he helps the police investigation, even the police are exasperated with his lack of resolve. Sometimes he manages to summon up some strength, but he has a very consistent pattern of failing to live up to his own expectations. The question for the reader is whether most of the rest of us would really be stronger and less stupid when confronted by physical danger. Edward's novel is dramatically written, taking Tony Hasting's point of view but always keeping him at a little distance. After the night in Maine, he imagines what happened to his wife and daughter, and he imagines how other people view him. He is a middle aged mathematics professor and his main power is to fail students. He is no match for thugs. We get some perspective on Tony Hastings from Susan as she reads her ex-husband's novel. We learn more about their marriage and her frustration with him as he encouraged her to give up her own career plans in order to support him as he worked on becoming a novelist, with little progress. She fell for a surgeon and had an affair while they were married: the man who saved people's lives was more attractive than her husband who couldn't even successfully write a novel. But, of course, about 25 years later, he has written a novel, and a good one. So, as Susan wonders right as she starts reading, the question is what Edward's true reasons are for sending her this book. That's never spelled out in a clear way, and the end of the story leaves plenty of room for interpretation. The theme of the novel within the novel and the examination of threatened masculinity in the modern world make this a surprisingly sophisticated work. Each novel is quite short, more like a novella, and most of the characters are not filled out. Tony and Susan are certainly the main characters, but even they are not fully formed. Some of the more uncomfortable scenes don't seem very convincing. Yet other moments are described so well the book is memorable. The unabridged audiobook is performed by Lorelei King playing the main narrator taking Susan's viewpoint and Peter Marinker taking Tony's. It's a strong production which brings appropriate seriousness to the most traumatic moments and remains calm during moments of chaos. It's a compelling reading.